It was strange being in the USA (well, California at any rate) when a 25-year old man from Richmond Hill was reported to have deliberately driven a rented van along the sidewalk on north Yonge Street in Toronto, killing eight women and two men, and injuring another 16. At least the TV we were watching in Petaluma, CA (CNN, MSNBC — same as we watch in Toronto actually) — noted the kinder and gentler way the Toronto police soon enough got their man (with special reference to the deft use of minimum force by Constable Ken Lam). Yet catching up on what had happened when we returned to town several days later was not altogether easy. I haven’t actually read this article. You have to pay for that. I put so much on the net for free myself (whether readers want it or not of course) that I find it impossible to pay for anything else. 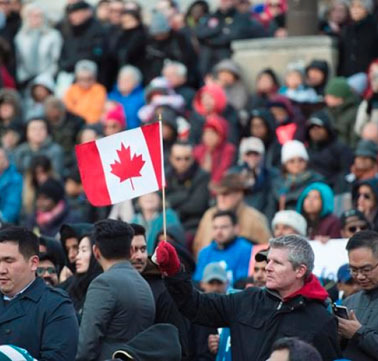 Wayne Adam from faraway Danforth and Greenwood holds up a Canadian flag at vigil remembering the victims of deadly van attack, at Mel Lastman Square in Toronto on Sunday, April 29, 2018. THE CANADIAN PRESS/Frank Gunn. Even several days later, early in May 2018, exactly what drove “accused killer Alek Minassian” to do what he did on north Yonge Street in Toronto (and then unsuccessfully ask Constable Lam to shoot him) is a story with complex depths. It will take time (and a weakening drive to ignore painful truths) to discover and even longer to understand. Another crazy attack in some crazy war on women or against feminism or whatever? 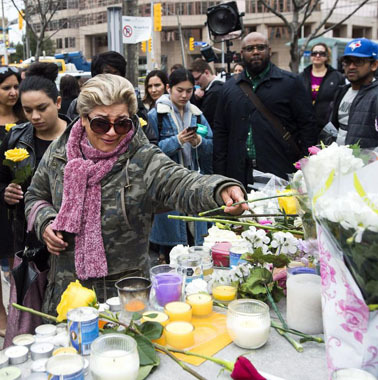 Ozra Kenari places flowers at a memorial for the victims of the tragic van killings on north Yonge Street in Toronto, the day after. Photo : Nathan Denette/Canadian Press. 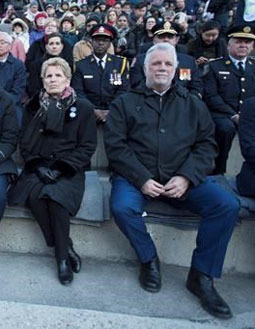 Ontario Premier Kathleen Wynne and Quebec Premier Philippe Couillard at Toronto Strong vigil, April 29, 2018. THE CANADIAN PRESS/Frank Gunn. From a strictly Canadian point of view, the closest analogue is no doubt the early December 1989 école Polytechnique massacre of 14 women in Montreal, by another tragically deranged 25-year-old male,? Marc Lépine. 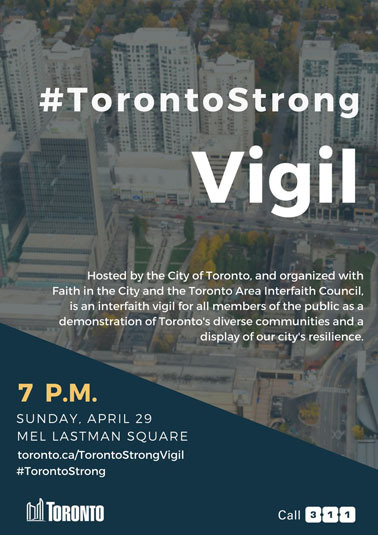 And a reassuring historic (if only accidentally related) touch at the April 29 “Toronto Strong” vigil was the presence of Quebec Premier Philippe Couillard, alongside Ontario Premier Kathleen Wynne, Canadian Prime Minister Justin Trudeau, and Toronto Mayor John Tory. I also saw parts of the Toronto Strong vigil on TV. One of the women interviewed actually did say “things like this don’t happen in Toronto.” But of course they do. There are moments when some of us still imagine we are still part of some uniquely “Peaceable Kingdom” from the 1950s (or 1970 at least) — a place fortunately apart from the unruly modern-and-postmodern struggles of the United States, the United Kingdom, or France (and many other places from China to India to South Africa, Mexico, Brazil, Malaysia, Australia, and on and on). 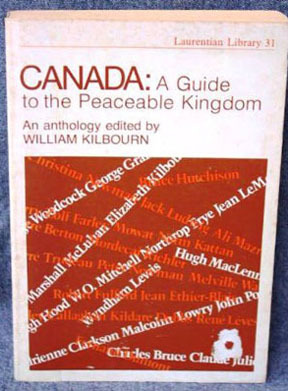 Canada : A guide to the peaceable kingdom was first published in 1970. But in this early spring of 2018 we returned from California to a Toronto that had just confronted one painful truth it likes to ignore. It is part of the same global village as everywhere else, and it has the same problems. But, like the larger Canada whose largest metropolis it is at the moment, Toronto has the same problems as other comparable places of the early 21st century elsewhere. People are in fact murdered in the naked city. And sometimes crazy mass murderers do crazy things, for political and other reasons that just don’t make sense. As if to underline the point in what some are doing their very best to see in a not-crazy way, we also returned from California to an Ontario (Canada’s most populous province, of which Toronto is the capital city) that seems about to elect the Trump-Brexit acolyte Doug Ford (older brother of former Toronto Mayor Rob Ford), as its premier or provincial prime minister. Some parts of both Toronto and the larger Ontario that stretches all the way to Hudson Bay are apparently enthusiastic about joining the wider international illusions of our time. 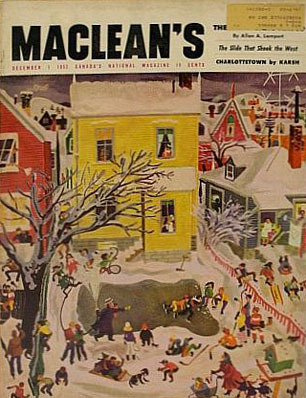 Maclean's — Canada's National Magazine, December 1, 1952. Đặt cược miễn phí ngay bây giờ 2019 Does murder in Alice Munro country early last spring say things about the troubled big political picture today?